Astronomers have found evidence for a pulsar within a supernova remnant in the Small Magellanic Cloud. X-rays from Chandra and XMM-Newton show that the pulsar is rotating remarkably slowly — only once every 18 minutes. This object, known as SXP 1062, lies near a spectacular star-forming region of dust and gas (seen in optical light). In this composite image, X-rays from Chandra and XMM-Newton have been colored blue and optical data from the Cerro Tololo Inter-American Observatory in Chile are colored red and green. 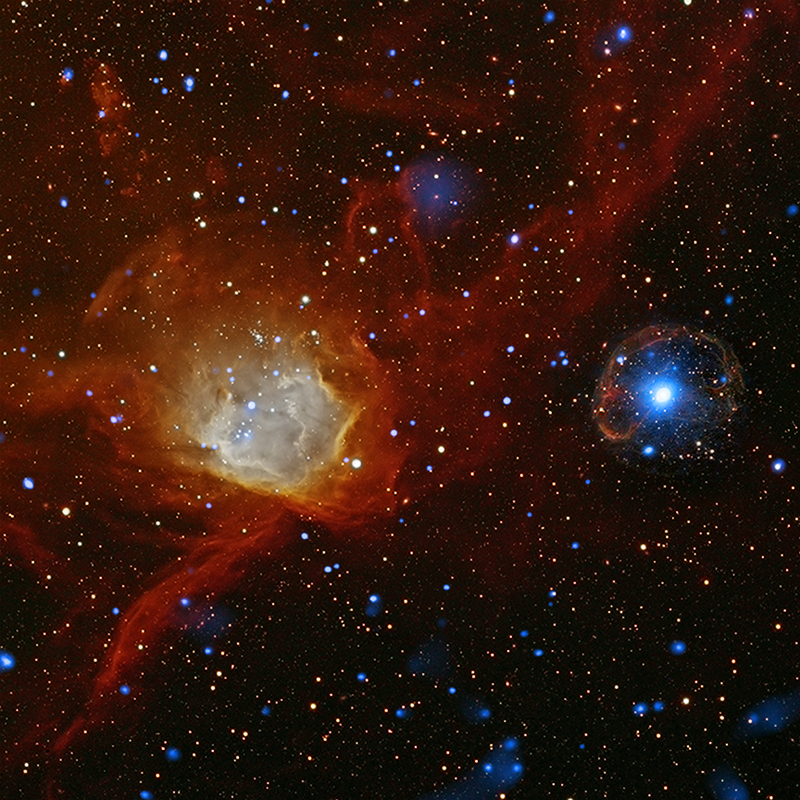 The pulsar, known as SXP 1062, is the bright white source located on the right-hand side of the image (roll your mouse over the image above) in the middle of the diffuse blue emission inside a red shell. The diffuse X-rays and optical shell are both evidence for a supernova remnant surrounding the pulsar. The optical data also displays spectacular formations of gas and dust in a star-forming region on the left side of the image. A comparison of the Chandra image with optical images shows that the pulsar has a hot, massive companion. Astronomers are interested in SXP 1062 because the Chandra and XMM-Newton data show that it is rotating unusually slowly — about once every 18 minutes. 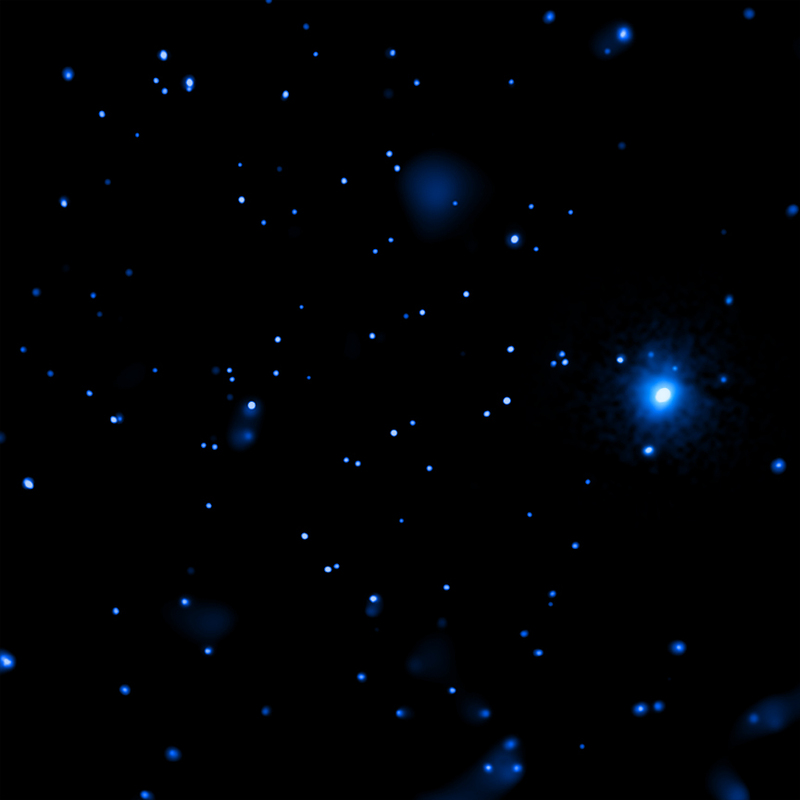 (In contrast, some pulsars are found to revolve multiple times per second, including most newly born pulsars.) This relatively leisurely pace of SXP 1062 makes it one of the slowest rotating X-ray pulsars in the SMC. Two different teams of scientists have estimated that the supernova remnant around SXP 1062 is between 10,000 and 40,000 years old, as it appears in the image. This means that the pulsar is very young, from an astronomical perspective, since it was presumably formed in the same explosion that produced the supernova remnant. Therefore, assuming that it was born with rapid spin, it is a mystery why SXP 1062 has been able to slow down by so much, so quickly. Work has already begun on theoretical models to understand the evolution of this unusual object. I'm always overwhelmed at achievements how astronomy has opened my mind to the beauty and mysteries of our universe. I feel deep respect and deeply thankful to scientists that I found a hobby insatiable hunger for knowledge. My heartfelt wishes to you all. Excellent education tool/porthole/trigger to encourage young people to research further into astronomy/physics & hence maths chemistry etc. My long science based career was triggered by one article in a proceedings journal at 10 yrs old. @ 75yrs old I have never lost interest and still study. I love this site, very rich with valuable information.